A couple of years ago I heard an interview with some of The Onion's editors on NPR. They talked about the writing process and how they choose which funny fake news stories to run. The answer: It all boils down to the headline. At editorial meetings, each writer comes to the table with a list of possible story ideas. To introduce each idea, all they do is read the headline they've written for the story. If everyone laughs, they know they have a winning concept that may be worthy of a full story. In The Onion world, a good headline delivers the whole story, complete with the punchline. The rest of the news story simply takes the core idea and expands on the joke. So where's the music marketing lesson? Well, what's your headline? How do you describe your band or your new CD or your next gig so that people immediately "get it"? Because, once they get it, then -- and only then -- can you expand on the premise and feed them more. If an Onion writer has to take even one minute to explain a funny premise, the idea is dead in the water. The Onion's editors believe their readers shouldn't have to work hard to comprehend and enjoy entertainment. Treat your fans and potential fans with the same respect. 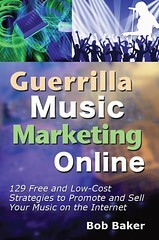 Check out Guerrilla Music Marketing Handbook, my bestselling, "must-have" title. Now revised and updated, with four new chapters on Internet music promotion. Get more details here.